After all of the things that I have heard about African air travel, I must say that I am a very lucky guy. No delays owing to scheduling or maintenance issues, no missed connections, no lost luggage, and no evidence that someone tried to break into my luggage. The only drama was on the plane from Nairobi to Kigali – one poor chap bound for Abidjan was somehow found his way onto our plane. Because he didn't speak English or French, and perhaps even Swahili, he had no idea. Anyway, 45 minutes after we were due to depart, they finally worked out it was him! I'm not sure how he would feel - grateful for not ending up in Kigali airport, where it's not that easy to buy a ticket back home, or for missing his correct flight. 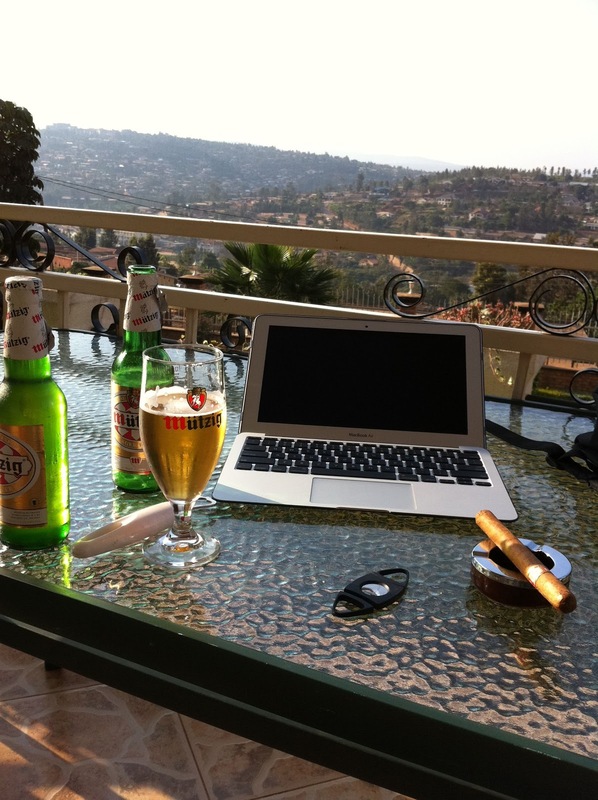 I experienced a moment on the plane to Nairobi, when I realised that I forgot to pack any cigars. Fortunately, Nairobi airport has a respectable walk-in duty free humidor, which sells everything from Cohiba Behikes at a bargain USD36.50 a stick for the 54s and less for the 52s. I chanced upon a treasure, though - Hoyo du Monterrey Des Dieux (one of my favourite cigars in the world!!) at the bargain price of USD42 for a pack of 5. That in itself isn't necessarily enough to write home about for these very hard to find stogies. It was the fact that they were from the April 2003 batch - 8 year old quality vintage cigars. Read it and weep. Anyway, I'm staying at the Step Town Motel. At only USD50 a night, it's a real bargain, especially when you consider the fact that the swankier hotels cost between USD250 to upwards of USD400 a night. If I have time, I will visit the Rwanda Memorial Centre, which serves as a memorial for the tragic genocide which occurred in 1994 as well as the Hôtel des Mille Collines (review coming soon), which was the subject of the movie Hotel Rwanda. The service is warm and friendly, and the rooms are clean and come with a huge balcony. 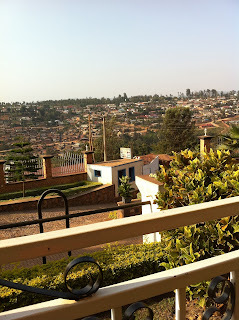 The only catch is that it's located on a pitted, winding dirt road in the residential area on one of Kigali's 4 hills. It is centrally located, though - a short walk (albeit arduous) walk from the city centre, and overlooking the diplomatic quarter. I would thoroughly recommend this place if you are planning a holiday, especially if you enjoy being immersed in the local environment. I would also recommend it as business accommodation, because it's excellent value for money, the staff are warm, friendly and will go out of their way to help you, and will even remember what you like. I was going to be late for a business meeting because the taxi driver whom I booked slept in, and John the Manager kindly offered to drive me there after trying in vain to order a taxi which would arrive in less than 15 minutes. Once you get over the slight accessibility issue, and have the phone numbers of a few reliable local taxi drivers in your phone (and the staff can help you here), you're cooking with gas! 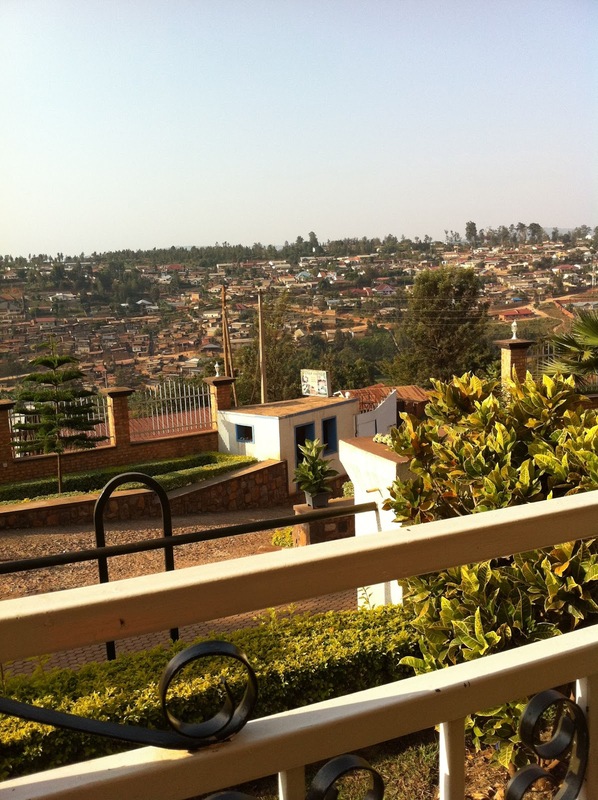 But the view of the Rwandan sunset from the balcony is peaceful and amazing. And the USD1 local beers are also very refreshing after a hard day's work! Even better are the sounds of the locals somewhere down the hill having a bit of a party - lots of African singing, drums, yelling and cheering. For dinner, I had a fried Tilapia fillet (a variety of carp caught from Lake Kivu), Goat Brochettes (basically pieces of goat skewered on a stick and barbecued) and fried plantains. The goat was chewy, but not rubbery. The smokey barbecued tang nicely complemented the texture. At Rwf700 (slightly more than AUD1) a stick, a bargain. And the tilapia was nice and moist. The plantains (on the menu as “banana”) were a bit of a novelty to me - the last ones I ate were filched from a tree next to where I used to live (and it stopped producing anymore after that. Not my fault!) Split lengthways and fried like potato wedges, the texture was a bit dry and it was really dense - heavier than a potato wedge - some serious carb loading here. And I only asked for one, so that is a seriously large banana! 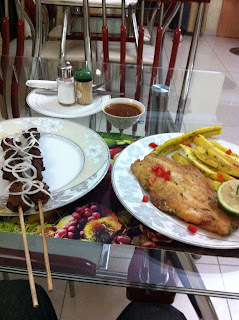 The meal came with a thick dipping sauce for the brochettes, which I used liberally for my plantains. The star of the meal has to be the locally made Akabanga chilli oil, which came in a little plastic bottle which dispensed by the drop – ahh just my kind of stuff!! This isn’t the hottest I’ve tasted in my life, but it was certainly tasty – of the normal chilli variety, which made a nice change from the habanero and naga/jolokia based stuff I’ve recently been nuking my stomach lining with. Anyway, it was an uncharacteristically early night for me - either the jet lag or the 4 bottles of Rwanda-brewed Miitzig beer which I had consumed (a highly refreshing crisp lager-style) - or maybe both. Oh and I have a few more pics - check back again when I have enough bandwidth to upload them! Ok, the last two photos are up!